Omni-ID IQ 600 - Best Uses: One way transit packaging, Blood bag tracking. Supply Chain RTI's. Mimimum order quantity of 100. 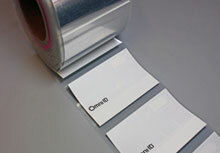 Thermal labels compatible with the Omni-ID RFID Labels. The Omni-ID IQ-600-LABEL is also known as IQ-600-LABEL	or IQ600LABEL	.